Finding a school that is the right fit for you can be difficult. What do you want to study? Where do you want to live? Will you be pursuing an undergraduate or graduate degree? For Christian students the options may seem even more limited. Where do you go to find a school with high academic excellence and expectations that also respects your values and supports your religious needs? As a student interested in a career in psychology, social work or counseling, it’s no surprise that you may also be looking for a Christian school to foster your studies. Psychology is at its heart a moral discipline. Without a strong sense of faith and morality, how can you lead others to the right path for their own lives? Whether you are looking to pursue a career in pastoral counseling or forensic psychology, maintaining your theological foundation throughout your studies will help you to become a stronger and more effective leader and helper. 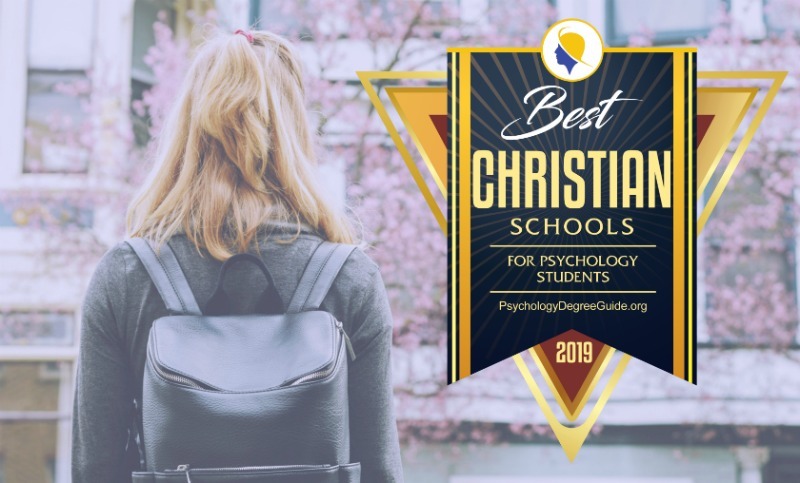 Below are our top 50 choices for Christian schools for students interested in psychology. These schools were not chosen at random! We created a rigorous six-point metric system that we applied to over 200 schools across the country. The schools listed here are the best of the best. Want to know more about how we developed our ranking system? Click here. Our Lady of the Lake University’s online Master of Arts in Counseling program features a curriculum aligned with the Council for Accreditation of Counseling and Related Educational Programs (CACREP) Standards and offers three career-specific specializations: School Counseling, Clinical Mental Health Counseling and Clinical Rehabilitation Counseling. They also offer their acclaimed Master of Social Work (MSW) degree program entirely online. Read our full review. While grounded in the liberal arts, the Master of Social Work curriculum at Sacred Heart University aligns itself to the tenets of social work and the Catholic Intellectual Tradition of academic excellence. The principles of service to others, respect for human dignity, dedication to scientific inquiry and social and economic justice are reinforced in coursework throughout the program. Read our full review. Saint Joseph’s University is a Jesuit Catholic University with a focus on strong academic excellence. Their Behavior Analysis Concentration is perfect for students who want to examine and address the underlying causes of human behavior and prepares students to sit for the Board Certified Behavior Analyst (BCBA) Exam. Read our full review. The online Master of Social Work at Saint Mary’s University of Minnesota prepares students for clinical practice. The coursework for the MSW is entirely online and the university displays strong Lasallian values, responding to students’ intellectual, spiritual, and developmental needs. Read our full review. Brigham Young represents the perfect combination of a competitive school with a high graduation rate and a relatively affordable tuition and that’s why it’s placed number one on our list. Immersed in the foundation of the Mormon faith, a BYU education allows students to focus on spirituality while pursuing both intellectual and character growth. While BYU offers an array of disciplines and programs, all teachings are meant to reflect the school’s primary mission to develop each student’s spiritual strengths. The psychology department at BYU emphasizes the importance of psychological research and is proud to offer funding for students to travel and pursue research interests. They focus on Applied Social Psychology, Developmental Psychology, Clinical Psychology and Cognitive and Behavioral Neuroscience with the opportunity to branch out into other related areas, most notably examination of Autism Spectrum Disorders. What makes BYU stand apart from other psychology programs is their accreditation through the American Psychological Association, Commission on Accreditation indicating that their programs meet the high standards set forth by the APA. Established in 1906, Abilene Christian University is a strong Christ-centered institution focused on guiding students through both spiritual and intellectual growth. While ACU is more costly than BYU, they are a very competitive school with a high graduation rate. ACU also boasts a large endowment which allows them to offer financial aid to over 90% of their students. ACU’s College of Education and Human Services School of Social Work is accredited by the Council on Social Work Education (CSWE). Their social work programs focus on research and evidenced-based practices filtered through a strong ethical approach. ACU’s graduate programs offer an MS in Social Work (M.S.S.W.) degree and a graduate certificate in Social Services Administration. While Kentucky Christian University is known for their high academic standards, they are most proud of their strong and interconnected Christian community. Life at KCU includes working closely with students and faculty to build relationships and character. KCU is also one of the most affordable private universities in Kentucky and still provides financial aid to the majority (95%) of their students. Located in the beautiful Shenandoah Valley, Eastern Mennonite University students have access to multiple outdoor activities very near their vibrant and inclusive campus in Harrisonburg, Virginia. On campus, EMU offers an environment that embraces strong Christian morals and values through a student body that represents dozens of Christian faith traditions from around the world. EMU’s Psychology Department offers both a minor and a major in psychology as well as a minor in neuroscience and an accelerated BA in psychology to MA in counseling option. Psychology students at EMU participate in 150 hours of psychology internships in offsite clinics and programs and are also encouraged to develop original research as part of their educational goals. Pepperdine is known for its academic excellence and high standards and that is reflected in their competitive 45% acceptance rate. However, Pepperdine firmly believes that higher learning must also be combined with higher purpose, which is why Pepperdine students will find themselves in a learning environment that is strongly influenced by spiritual commitment. Pepperdine graduates are well placed to influence the world and impact culture in a positive way. Pepperdine’s Psychology program focuses on applying scientific methodologies to real life experiences. Psychology students are presented with multiple opportunities for field placements and work experience while their school work prepares them for graduate examinations and for fulfilling their career goals. While Texas Christian University has an ongoing covenant with the Christian Church (Disciples of Christ), the school welcomes students from all religious denominations and offers over twenty recognized student religious organizations on campus. TCU was founded in 1873 and moved to the vibrant Fort Worth area in 1910. With its combination of a high graduation rate and high percentage of students receiving financial aid, TCU receives top-level marks on our list. TCU’s Department of Social Work is accredited by the Council on Social Work Education (CSWE) and emphasizes the responsibilities of graduates to serve their community. Students in the Department of Social Work learn to address societal problems through ethical and research-based approaches. Graduates are prepared to work with individuals, groups or even concentrate on local and national policies. Set on a beautiful and expansive 108-acre campus, George Fox University is ever expanding and modernizing its facilities, including a state-of-the-art fitness and student center as well as an updated dining hall. Of course education is the focus at GFU so they also boast the latest equipment in their science and nursing labs as well. Students in the GFU Department of Psychology benefit from the option to join research teams or participate in ongoing psychological projects. With a doctor of psychology (PsyD) program offered through GFU, undergraduates can plan to streamline their education and jumpstart their career by studying in one of the few Christian psychology degree programs receiving accreditation through the American Psychological Association (APA/CA). GFU also offers a BA and BS in psychology and a BS in cognitive science with concentrations in neuroscience or human and computer intelligence. Students interested in Social Work will also be happy to hear that GFU provides a MSW program that is accredited by the Council on Social Work Education (CSWE). Barclay College is one of the more affordable colleges to make our top ten list making their admirable ten to one student to teacher ratio even more impressive. Barclay College bases all their teachings on a foundation of biblical truth, keeping a focus on Christian life while training students to be effective moral leaders of their communities. With that in mind, BC’s Psychology and Family Studies program prepares graduates for family ministry. Barclay graduates develop a foundation equipping them for multiple career choices, from private clinical practice to working in health agencies or even focusing on research and teaching. Only six miles out from Boston, Eastern Nazarene College is often ranked highly amongst many reputable schools in Massachusetts including Harvard and MIT. Part of ENC’s mission is to help students find a balance between their spiritual and academic lives. ENC recognizes that for Christian students, the two are intertwined. ENC’s Social Work program is accredited by the Council on Social Work Education (CSWE) and attracts students who are interested in pursuing a career in which they can help others. The faculty in the Social Work Department at Eastern Nazarene College focus on creating an educational experience that is both comprehensive and ethical. Located on a beautiful campus in San Antonio, Texas, you would be forgiven for mistaking yourself to be in a Disney movie while walking through the stately historic buildings of Our Lady of the Lake University. As a Catholic university, OLLU prides itself in adhering to the core values of the founding Congregation of Divine Providence while also striving to fulfill high levels of academic excellence. These high standards are reflected in their psychology programs being accredited by the American Psychology Association (APA). With online Master’s degrees in Clinical Mental Health, Clinical Rehabilitation Counseling, School Counseling and Social Work, OLLU offers diverse opportunities to pursue your career goals. OLLU’s programs focus on preparing students to apply for proper certification and licensure, ensuring that OLLU graduates are perfectly prepared to enter the work force upon graduation. The Baptist College of Florida, located in Graceville, Florida, focuses on creating an active Christian community both on campus and abroad. BCF values international study opportunities as well as technological advances to increase students’ opportunities to impact the world in a positive and Christ centered way. Their Psychology program prepares students to be thoughtful and knowledgeable in the psychology and counseling field while maintaining a strong Christian worldview. Founded in 1957, Lubbock Christian University has a student:teacher ratio of 12:1, and service plays a major role in every academic discipline. Adhering to a faith-based core program, LCU students are encouraged to perform community service work that’s relevant to their area of study. About 90 percent of students at this non-denominational Christian university receive financial aid. Psychology students at LCU are enrolled in the school’s Behavior Sciences Department, which also encompasses family studies. The department’s challenging curriculum is designed to prepare students for real-world experiences, whether graduate school or employment is the next move after receiving a Bachelor of Arts in Psychology from LCU. Located about 90 miles west of Detroit in south-central Michigan, Hillsdale College boasts an impressive 8:1 student:teacher ratio, one of the lowest in the U.S. Hillsdale College instructors understand the delicate balance between faith and science, and students are encouraged to remain open, honest and inquisitive in regards to the scientific method. The Hillsdale campus is rich with modern, hands-on research tools and facilities. On-campus resources for psychology students include a developmental psychology lab, social psychology lab and a connecting observation room that all research students can access. More research opportunities are available in Hillsdale’s cognitive psychology cubicles, which are outfitted with computers featuring state-of-the art research software. Originally called Clinton College as an homage to its home base in the North-Central region of South Carolina, Presbyterian College opened its doors in 1880. With a motto that places service work at the forefront of its teachings, PC has a 12:1 student to faculty ratio. PC students are expected to embody the principles of trust, integrity, respect, honesty and community responsibility. Faith integration within the sciences is strongly emphasized by Presbyterian College instructors. Psychology students can minor in the discipline or pursue a Bachelor of Science degree. Among the PC student body, 96 percent receive financial aid, and the school’s graduation rate is a respectable 65 percent. Ethical and social responsibility, scientific inquiry and critical thinking are just a few of the fundamental lessons taught to psychology students enrolled at Arizona Christian University. Nestled in the heart of Phoenix, ACU is private, non-profit and regionally accredited. Psychology is one of the many programs offered at the university’s Department of Behavioral and Social Sciences. Along with the learning objectives recommended by the American Psychological Association, such as professional development and communication, ACU instructors emphasize a biblical worldview. ACU has been known by several names since its founding in 1960. The small college that began as Southwestern Conservative Baptist Bible College received its current moniker in 2011. The liberal arts university is non-denominational, and about 70 percent of ACU students receive financial aid. The vibrant history of Hardin-Simmons University dates back to 1891. Known for its gorgeous, expansive campus as well as quality education, HSU encompasses more than 200 acres. HSU’s student:teacher ratio is an admirable 12 to 1, and 86 percent of students receive some sort of financial assistance. The undergraduate psychology program is just one of the many disciplines offered by the Department of Psychology and Counseling. HSU psychology students learn how to objectively evaluate human behavior on a variety of levels, including biological dimensions, psychological perspectives and interpersonal/social context. Students who are pursuing a graduate degree in psychology at HSU have the opportunity to gain real-world counseling experience, with guidance from licensed faculty members, in the school’s on-campus Psychology and Counseling Center. Low-income residents in Abilene and the surrounding area can seek individual, couples or family counseling at the facility. Southwest Baptist University doesn’t offer an undergraduate psychology degree per se, but students looking for a career in mental health services can pursue a Bachelor of Social Work (BSW) at the university. Every SBU course emphasizes a Christian worldview, and each department has claimed a bible verse as its mission statement. The verse adopted by the Department of Behavioral Sciences is 2 Peter 1:5-7. Thus, knowledge, perseverance and goodness are the cornerstones of its teachings. The accredited university carries a 90 percent acceptance rate, and nearly every student at SBU receives financial aid. Extracurricular opportunities afforded to Behavioral Science students include the Social Work Club and the Phi Alpha Honor Society. Students can also take part in the department’s Field Education program. Behavioral Science majors at SBU have performed field work at a number of local facilities, including domestic violence shelters and hospitals. Sacred Heart University is rooted in the Catholic intellectual tradition and is committed to promoting the common good while serving others, especially the poor and suffering. With this foundation, SHU’s Social Work programs are particularly exceptional. While grounded in the liberal arts, the Master’s of Social Work curriculum at SHU aligns itself to the tenets of social work and the Catholic Intellectual Tradition of academic excellence. The principles of service to others, respect for human dignity, dedication to scientific inquiry and social and economic justice are reinforced in coursework throughout the program. Located in Philadelphia, Saint Joseph’s University is a Jesuit Catholic University that provides a strong educational experience while maintaining a focus on the whole student. SJU encourages critical thinking and academic excellence, but not at the expense of personal moral growth and a development of ethical standards rooted in the belief that God exists in all things. Their online MS in Criminal Justice with a Behavior Analysis Concentration prepares students to sit for the Board Certified Behavior Analyst (BCBA) Exam. The Behavior Analysis track is ideal for educators, mental health experts, psychologists, school resource officers, and others who examine and address the underlying causes of human behavior. This track is also offered as a post-graduate certification. The great outdoors and quality education collide at Finlandia University, which is the only higher learning facility in North America that was founded by Finnish immigrants. Affiliated with the Evangelical Lutheran Church in America, the private, non-profit liberal arts college has a 9:1 student to teacher ratio and a gorgeous, sprawling campus. Affectionately known as FinnU, Finlandia has been a fixture in Hancock, Michigan’s northernmost city since 1896 when it was known as Suomi College. Psychology is one of the many majors offered at FinnU, and sub fields including behavioral psychology are emphasized in individual courses. In order to receive a bachelor’s degree, psychology students are required to complete a research project. Many students also complete an internship to gain real-world experience and career insights. Study abroad opportunities are also available to FinnU psychology majors. In 1939, Multnomah University handed out its first diplomas to a graduating class of 31. The interdenominational higher learning facility has grown exponentially since that time: As of 2017, more than 400 students were enrolled at Multnomah with about 85 percent of those students receiving financial aid. Regionally accredited, Multnomah University is a member of the Northwest Commission on Colleges and Universities. Students in the school’s psychology program are taught to integrate a biblical worldview with modern ideas on human behavior and scientific principles. Psychology students at Multnomah focus on several key themes, such as human diversity issues, foundational psychological history and theory, and psychological research. Every course at Multnomah is rooted in the Word, and seniors are given plenty of real-world experience through a hands-on, faith-based practicum. Multnomah’s student to teacher ratio is 14:1. U.S. News & World Report rankings put Trinity Christian College in the top tier of Midwest colleges, and it’s easy to see why. The highly selective school offers 70 degree options, including a master’s degree program in counseling psychology. Trinity instructors take an innovative approach to the field of psychology. Along with a psychology major or minor, students can pursue an art therapy degree. Understanding, healing and Christ-centered principles serve as the foundations of every psychology course at Trinity. More than 1,400 students were enrolled at the regionally accredited liberal arts school in 2017. Trinity students enjoy a half-hour commute to Chicago as well as an 11 to 1 student to teacher ratio. Located on a sustainable campus on the Gulf Coast of Florida, Eckerd College boasts humble roots that stretch back to 1960. Originally known as Florida Presbyterian College, Eckerd has a 73 percent acceptance rate, and more than 90 percent of students receive some type of financial assistance. Eckerd students enjoy a covenant relationship with the Presbyterian Church and are encouraged to respect their pristine campus environment. Conservation efforts at Eckerd include a campus-wide recycling program run by volunteers and an impressive solar array that’s strong enough to power two buildings. At Eckerd, students can pursue a B.A. or B.S. in psychology, and within the department, undergrads and graduate students alike have a unique learning opportunity. Within Eckerd’s comparative psychology lab, students can study animal behavior in order to gain a higher understanding of the human mind. The dog cognition lab is located on Eckerd’s campus. Set on 340 acres, Gustavus Adolphus College is rooted in Evangelical/Lutheran teachings and has an admirable graduation rate of 81 percent. The private liberal arts school was founded in 1862 and still operates on its original core values: Community, excellence, faith, justice and service. In 2015, Gustavus was recognized as a Community-Engaged Campus by the Carnegie Foundation, and more than 75 percent of students are actively involved in service work. Gustavus psychology students are part of the Department of Psychological Science. Those who major in psychological science will gain an objective understanding of human behavior under the tutelage of highly trained faculty members. International study is encouraged in every department at Gustavus. Highly regarded and accredited by the Council on Social Work Education (CSWE), Jarvis Christian College is a private, historically Black college with a campus that spans about 243 acres on the outskirts of Sandy, Texas. The school has been affiliated with the Christian Church (Disciples of Christ) since its founding in 1913, when it was known as the Jarvis Christian Institute. The generous open enrollment policy at Jarvis equates a diverse student body, with dozens of denominations represented within the school’s many areas of study. Students with a passion for service can pursue a B.S. in Social Work or opt to minor in Psychology or Social Work. Jarvis has a student to teacher ratio of 16 to 1, and nearly every student receives financial aid. Faith, scholarship and service serve as the fundamental education base at Oklahoma Christian University. Students are encouraged to think of OC as “home” and act according to the teachings of Christ both in and outside the classroom. In 2017, the Princeton Review named OC as one of the Best Universities in the West. Within the OC student body, 97 percent receive financial assistance. Psychology students have several degree options at OC, with most opting to pursue the pre-professional Bachelor of Science in Psychology. Students who prefer a more general liberal arts education can enroll in the B.A. program. No matter the degree type, OC psychology majors participate in a year-long research class during their senior year. Hobe Sound Bible College is an exceptional value in Christian education, with a yearly tuition of about $5,200. Offering an open enrollment policy and an 11 to 1 student to teacher ratio, Hobe Sound students receive a well-rounded, faith-based education that’s rooted in the Wesleyan tradition. The school was founded in 1960, and 24 students attended Hobe Sound during its inaugural year. Bachelor of Arts in Counseling students at Hobe Sound can minor in several relevant sub-disciplines, including pastoral ministries and child evangelism. Additionally, Hobe Sound counseling students can elect to pursue certification in either biblical or pastoral counseling. Vocational opportunities for counseling majors include attendance at the bi-annual American Association of Christian Counselors’ World Conference. An intimate 7 to 1 student to teacher ratio helps MidAmerica Nazarene University stand out as a top Christ-centered higher education facility. Founded in 1966, MNU opened its doors two years later to 263 students. Today, MNU houses a diverse student body that represents six religions and more than 40 denominations. MNU was ranked 75th on the list of Best Colleges — Regional Midwest 2018, as chosen by U.S. News & World Report. Around 70 percent of MNU students receive financial aid. In the psychology department at MNU, faith and science merge, and all psychology students are required to complete a relevant internship in order to graduate. From counseling fundamentals to the principles of experimental neuroscience, MNU psychology students receive a well-rounded education rooted in Christ’s teachings. At Geneva College, nearly 100 percent of students are awarded financial aid, and 65 percent of students who enter GC as freshmen go on to receive their degree. Geneva is ranked as the No. 3 Best Value by U.S. News & World Report and has a student to teacher ratio of 12 to 1. Governed by the Reformed Presbyterian Church of North America, Geneva is also recognized as both a College of Distinction and a Christian College of Distinction. Psychology is one of four majors offered by Geneva College’s Department of Psychology & Social Services. Students within the department enjoy a variety of opportunities, such as membership in Psi Chi and a curriculum that merges theoretical psychology with Biblical teachings. Minnesota’s first university, Hamline’s rich tradition continues into the modern era. Among Hamline University’s recent accolades is a ranking of No. 16 on U.S. News & World Report’s list of Best Regional Colleges — Midwest. Additionally, Forbes selected Hamline as one of its “America’s Top Colleges” in 2017, for the tenth year running. Giddens Learning Center serves as the home base for psychology students at Hamline. There, students can network in the expansive common area or conduct research in the facility’s state-of-the-art interaction lab, which is outfitted with monitoring equipment and recording devices. The largest Christian university in the world, Liberty University is located on more than 7,000 acres in Lynchburg, Va. Founded in 1971, Liberty is private, non-profit and accredited by the Southern Association of Colleges and Schools Commission on Colleges. While remaining highly selective, with a 22 percent acceptance rate, Liberty is one of the most diverse faith-based colleges in the U.S. More than 85 countries and every U.S. state are represented within the LU student body. About 95 percent of Liberty students receive financial aid. Three degree programs are offered through Liberty’s Department of Psychology, part of the School of Behavioral Sciences. As part of a well-rounded education, psychology majors are encouraged to participate in extracurricular activities and organizations, such as Club Psych, Psi Chi and the departmental internship program. Embodying “Education for Character” since 1866, Roberts Wesleyan College proudly integrates the teachings of Jesus Christ into every department’s curriculum. Along with a Christian worldview, the backbone of RWC programs are the college’s “three R’s”: Research, restoration and renewal. The overall graduation rate of RWC students is 63 percent, and about 97 percent of students receive financial aid. In 2018, Roberts Wesleyan was named a Best Regional College by the Princeton Review, and the college ranks seventh on the list of 10 Best Christian Colleges and Universities in the North 2017. Service and God’s truth are the foundations of RWC’s Psychology program, which strongly emphasizes a scientific approach and the value of critical thinking. Students can choose from a B.A. or a B.S. in Psychology, and an Accelerated 3-Year B.A. in Psychology program is available for those students looking for a challenging, fast-track to graduation. One of the most decorated online universities in the U.S., Regent University also holds classes on its Virginia Beach campus. Regent students, 84 percent of which receive financial aid, can choose from 128 fields of study. Working under the motto, “Christian Leadership to Change the World,” Regent topped the list of Best Online Bachelor’s Programs in Virginia in 2017 from U.S. News and World Report. The institution also earned an “A” rating for its stellar liberal arts curriculum from The American Council of Trustees and Alumni (ACTA), one of only 25 U.S. universities to be awarded the distinction. Undergraduates can work towards a B.S. in Psychology or a B.S. in Clinical & Counseling Psychology. Selected as the Best Christian College in Ohio as well as one of the Best Small Colleges in the Nation, Mount Vernon Nazarene University has been a community leader since 1968. Instructors at MVNU challenge their students on a daily basis, empowering them to keep the Spirit of Christ alive both inside and outside the classroom. Serving as the official university of the East Central Educational Region of the Church of the Nazarene, MVNU has a competitive 14 to 1 student to faculty ratio. A personalized course load and plenty of research opportunities are just two of the standout perks offered to students enrolled in MVNU’s Psychology program. Research plays such an integral role, in fact, that many seniors present their honors thesis at the annual MVNU undergraduate research symposium (sURC), with the support of their instructors. Each program of study at American Baptist College is designed to prepare students for faith-based leadership and ministry opportunities long after graduation. Offering an open enrollment policy and an 11to 1 student to teacher ratio, ABC was founded in 1924. One of the nation’s Historically Black Colleges & Universities, ABC is recognized by the Council on Higher Education Accreditation. Students working towards their Bachelor of Arts in Behavior Studies at American Baptist College can choose from three areas of concentration: Addictions Studies, Child Welfare and Mental Health. Nearly 80 percent of students receive financial aid. San Diego Christian College is a highly selective institution that offers 50 programs of study and has a strong 8 to 1 student to faculty ratio. The majority of students at SDCC receive a general liberal arts education during their freshman and sophomore years and move on to their chosen concentration as a junior. Students enrolled in the SDCC Psychology program can opt to study the overall discipline or focus on either Biblical counseling or Organizational Psychology. SDCC holds accreditation from the Western Association of Schools and Colleges (WASC). About 56 percent of interested applicants are accepted to SDCC, and almost every student receives financial aid. A 2017 U.S. News & World Report Best Regional University, California Baptist University was founded in 1950 and today employs a staff of 100 percent Christian individuals. Undergraduates can choose from 76 majors and 95 percent of CBU students receive financial aid. The CBU Psychology program has earned the stamp of approval from the Board of Behavioral Science Examiners. Within the program, optional concentrations are offered in several disciplines, including Medical Anthropology, Sports Psychology and Social Work. CBU Psychology students exemplify what it means to be a Christian intellectual, keeping a Christ-centered worldview long after graduation. Saint Mary’s University of Minnesota bases its values in the Lasallian Catholic heritage. They strive to empower their students to live ethical lives of service and leadership. SMU fosters an inclusive community that respects all people and values helping those who are suffering from injustices. In the Master’s in Counseling and Psychological Services program at SMU, students gain an understanding of the complex nature of human behavior and social interaction from professors who are experts in the counseling field. Throughout the two-year program, students learn to assess children, adolescents, individual adults, couples and families to determine how to best help them work through difficult issues and challenges. The degree offers a dual program option to earn a Graduate Certificate in Addiction Studies. Cairn University has a rich history that stretches back nearly 100 years. The institution has gone by a number of names since its founding nearly 100 years ago and became known as Cairn in 2012. Nearly all interested applicants are accepted to Cairn, and 66 percent of incoming students go on to receive their degree. At Cairn, believers with a passion for service work and a fascination with human behavior can enroll in the M.S. in Counseling program. Using the Bible as a guide, Cairn instructors emphasize the fundamental importance of service work, healing and community. The two-year program, which includes summer terms, is designed to prepare students for a professional career in licensed counseling and social work. Counseling students at Cairn receive hands-on training at the nearby Oasis Counseling Center. A generous open enrollment policy and nominal tuition fees make Faith Evangelical College & Seminary an attractive option among Christian students of all denominations. Known as Faith International University since 2016, the higher learning facility attracts dedicated, high achieving students, contributing to an 82 percent graduation rate. Faith International University was founded in 1969. Psychology students interested in furthering their education beyond a bachelor’s degree can pursue a Master of Arts in Christian Counseling (MACC) from Faith Evangelical. The challenging, multicultural, faith-based program is designed to lead students toward professional licensure or employment in a variety of mental health facilities. MACC students are required to complete 72 hours of coursework, including hands-on research or interning. Founded as a boarding school by the Society of Friends in 1837, Guilford College was transformed into a four-year higher learning facility in 1888. Where once the Underground Railroad passed through the woods behind Guilford, today the renowned institution is a leader in social change, activism and sustainable living. Sierra Magazine placed Guilford number seven on its list of green initiatives in food sustainability. Guilford students are committed to representing the seven core values of the institution: Community, diversity, equality, excellence, integrity, justice and stewardship. A Bachelor of Arts in Psychology is one of the many degree options offered at Guilford, which has a 14 to 1 student to teacher ratio. At Guilford, students are encouraged to participate in a number of service-based organizations, including the Center for Principled Problem Solving. Known as Northwest Christian University since 2008, the former Eugene Divinity School is considered one of the Best Value Among Colleges in the West by U.S. News & World Report. The private liberal arts university was founded in 1895 and has a 66 percent graduation rate. NCU boasts membership in the Council of Independent Colleges and is accredited by the Northwest Commission on Colleges and Universities. Psychology is one of NCU’s most popular areas of study and all psychology majors graduate with at least 135 hours of field experience. Instructors merge modern data and research methods with Christian teachings, giving NCU psychology students a well-rounded education. The average class size at NCU is sixteen. The primary mission at Hannibal-LaGrange University is exercising a multi-faceted model of learning and service that encompasses the community. Accredited by the Higher Learning Commission and affiliated with the Missouri Baptist Convention, HLGU offers more than 34 areas of study. The HLGU campus is situated on 110 hilly acres and enjoys close proximity to historic downtown Hannibal. Theology and psychology collide in the Behavior Science department at HLGU. Within the department, students can work towards a B.A. or B.S. in Psychology and class sizes are relatively small. The student to teacher ratio at HLGU is 12 to 1, and about 93 percent of students receive financial aid. Known as Circleville Bible College upon its founding in 1948, Ohio Christian University has evolved from a small college where clergymen could further their religious education into one of the top Christian colleges in the U.S. OCU is accredited by the Association for Biblical Higher Education and The Higher Learning Commission. At OCU, students receive individualized attention thanks to a student to teacher ratio of 10 to 1. The Psychology Department has two degree options, both of which are rooted in Christian principles. Students can pursue a B.A. in Chemical Dependency Counseling or a B.A. in Psychology, with a concentration in research, pre-counseling or general psychology. More than 140 fields of study are offered at Olivet Nazarene University, and about 94 percent of Olivet students receive financial aid of some type. The school’s motto is “Education with a Christian purpose,” and faculty members have worked hard to remain faithful to the slogan since Olivet’s founding in 1907. Psychology majors can work towards either a B.A. or B.S. degree, and research opportunities are abundant within both programs. Research projects within the student’s field of interest are encouraged, with guidance from faculty members. Hands-on field work at local mental health facilities is also part of Olivet’s Psychology program. At Tabor College, students receive service-based instruction, practical experience in their chosen field of study and community fellowship in a dynamic learning environment. The spiritual foundation at Tabor is based on the Mennonite Brethren Confession of Faith, but all servants of Jesus Christ are invited to apply. Thirty-two states and 12 countries are represented in the Tabor student body. The school has a low student to faculty ratio of 12 to 1, and 87 percent of Tabor students receive financial aid. Tabor was founded in 1908 and today is accredited by The Higher Learning Commission. Psychology majors at Tabor are part of the college’s Social and Behavioral Science Department. Affiliated with the Baptist General Association of Virginia, Averett University has served as a community leader since 1859. Today’s Averett student body of nearly 2,000 maintains an average class size of 12 and a 13 to 1 student to teacher ratio. Averett is private and fully accredited, and the university’s core values include a spirit of discovery, a commitment to faith-based service and high ethical standards. Psychology is one of the more than 30 programs of study offered at Averett, with concentration options available in integrative health, biological psychology and clinical and counseling psychology. During senior year, psychology majors take part in hands-on research and topical seminars designed for professional development. At Georgetown College, the instructors are among the top minds in their field — 96 percent of faculty members have a PhD or equivalent. The average class size at Georgetown is 13, and the higher learning facility has accreditation from the Southern Association of Colleges. Psychology is one of Georgetown’s most popular areas of study, but the department is small and intimate, encouraging a spirit of community and service. The department’s six faculty members mentor students both and in and out of the classroom, providing high-quality instruction as well as sponsoring Psi Alpha Omega and the Psi Chi international honor society. Georgetown psychology students can choose to specialize in animal psychology, which affords the opportunity to study abroad. Selected as a 2017 – 2018 College of Distinction, Northwest Nazarene University is a nonprofit, competitive liberal arts school with a 65 percent acceptance rate. Located on a sprawling, 90-acre campus in the Boise metro area, NNU holds accreditation from the Northwest Commission on Colleges and Universities. NNU was founded in 1913 and attracts a diverse array of students from all over the world. More than half of the student body belong to a denomination other than Nazarene. Students in NNU’s Department of Psychology, Cultural Anthropology, and Criminal Justice are given more than just a relevant education in their field of choice; Creative engagement, academic excellence and social responsiveness in a multicultural world are the cornerstones of a well-rounded, Bible-centered NNU education. All 50 states and dozens of denominations are represented within the Oral Roberts University student body. The ORU student to teacher ratio is a notable 16 to 1, and more than 90 percent of undergraduates at Oral Roberts University receive financial aid. ORU is accredited by the Higher Learning Commission and is a member of the Council for Christian Colleges and Universities (CCCU). ORU psychology students can choose to pursue a B.A. or B.S. degree, both of which are tailored to merge Christian principles with scientific study. Along with classroom-based instruction, students are encouraged to pursue learning opportunities from alternate sources, such as the campus psychology club Psi Chi Rho, which meets four times per semester. In addition, ORU students are top contenders in the Oklahoma Psychological Society’s annual Psychology Bowl. At Arlington Baptist University, faculty mentors embody a spiritual model of teaching in order to prepare students to serve God in all aspects of their life, both personally and professionally. Arlington Baptist has an open enrollment policy and a 13 to 1 student to faculty ratio. In a survey of 2016 graduates, 100 percent of students reported that their Bible knowledge increased during their time at ABU. The graduates praised ABU across the board, giving their alma mater high marks in personal development opportunities and the synchronization of Christian values and academic knowledge. A Bachelor of Science in Psychology is one of the 18 undergraduate degrees offered at ABU, which was founded in 1939. Within the psychology department, the human condition is understood within the context of God’s word. Ranked in the top tier of colleges in the U.S., Colorado Christian University is a storied interdenominational facility with a 14 to 1 student to teacher ratio. With a foundation that stretches back more than a century, CCU holds membership in the Council of Christian Colleges and Universities. Sixty-six denominations are represented within the CCU student body. The well-rounded, Christ-centered Psychology program at CCU empowers students to challenge mainstream ideas about human behavior. The curriculum provides a holistic, multi-faceted approach to psychological principles. Field work is encouraged, and psychology students are required to complete 135 internship hours in order to graduate. Situated a short 2 miles from downtown Nashville on 84 acres, Belmont University is an award-winning Christian college where 87 percent of classes have fewer than 30 students. Belmont served as the location of the 2008 Town Hall Presidential Debate and is considered one of the 50 Most Beautiful Christian Universities in the World. Equally renowned for its academics as it is for aesthetics, BU is one of 2018’s Most Innovative Schools, as chosen by U.S. News and World Report. It marks the tenth consecutive year that Belmont made the list. Belmont’s Department of Psychological Science is housed in the McWhorter building, which is outfitted with an array of discipline-specific laboratories, including the Learning and Conditioning Laboratory and the Physiological Psychology dissection area. Psychology majors have the opportunity to perform service work and take part in extracurricular activities such as the Psychology Club. A historical landmark as well as a groundbreaking higher learning facility, the University of Mary Hardin-Baylor was open to females only until 1971. The university, considered the oldest college for women west of the Mississippi, is accredited by the Southern Association of Colleges. Nearly 80 percent of interested applicants are accepted to UMHB, which is home to about 3,900 students annually. Students interested in the human condition can pursue either a B.A. or B.S. in Psychology at UMHB. The Psychology program is encompassed within the College of Humanities and Sciences, and objectivity is a key learning principle within the program.